Is a Board Seat Right for You? The statistics speak for themselves: “Research shows return on equity is 35% higher and total return to shareholders is 34% higher for companies whose top management teams include women,” said Donna Hamlin, Ph.D. Hamlin is the CEO of Boardwise.biz, a company providing governance advisory services to organizations. Hamlin educates others about the importance of women serving on boards, to achieve gender equity and help organizations perform better. 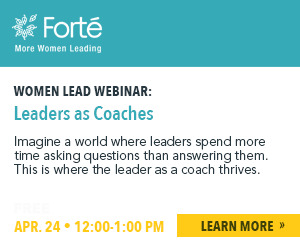 On May 18th, she presented a webinar for the Forté Foundation community, Is a Board Seat Right for You? Board membership is an honor, and it’s also an opportunity to influence the direction of an organization, apply your expertise in new ways or in a new industry, and expand your network to include people you may not otherwise meet. One of the most important aspects to a board of directors application is demonstrated problem solving ability. It is advantageous to mine for self-knowledge about one’s problem solving style. Hamlin’s company, Boardwise, offers an assessment called Board Bona Fide that creates a candidate profile and provides information on a candidate’s “board style” and board readiness. Said Hamlin, “We have an innate orientation about how we approach issues. If you evaluate how you problem solve early, you know where your natural proclivity is. You want to match your career and your job type to the natural way you orient to problems.” When it comes to problem solving, focusing on getting better at what you’re best at, will help you communicate the greatest value-add to boards. Hamlin explained that there are five types of boards: non-profit boards, advisory boards, municipal boards, private boards, and public boards. Hamlin said that 98% of board appointments are peer-based; thus, come up with a networking strategy. She said, “When men go to networking meetings, they tend to go with an agenda. Women go just to meet people that in the hopes that in the long term, it may be valuable.” Choose events where you sense that you will meet other decision makers and influencers, and be vocal about what your goals are. You can search for board opportunities online. Hamlin recommended BoardProspects.com, which she described as “a social Linkedin for board directors.” She also recommended that MBAs ask their schools to keep them apprised of notices they receive from companies looking to expand their board. Create a stand-out application package. A resume for a board position does not look like a standard resume; in fact, it’s not a resume at all. A “board bio” is less focused on your qualifications and what you’ve already achieved, and is much more focused on how you problem solve and how you can help the board make the best decisions. “It is one page, and focused on what you bring to the board table and what committee you should be serving on. It should be very targeted. There should also be differentiation about what you bring in your problem solving skills,” said Hamlin. Hamlin recommended looking at board bios of the members at BoardProspects.com. Hamlin recommends having another person look at your board bio to make sure that you have clearly conveyed your expertise and talents. “Women have a reticence to tell their own accomplishments. Men do it naturally, or rather, they’ve been trained to do it. It’s good to have someone else look at your resume and see if they might punch it up differently.” You want to make sure you convey your hard-earned expertise and your ability to create positive influence on an organization’s board. Interested in learning more about how to prepare and successfully apply for board memberships? Watch the Is a Board Seat Right for You? webinar here, and learn more about developing your own action plan to apply for director positions. You can also read more about women on corporate boards at the Forté Foundation Business 360° Blog.